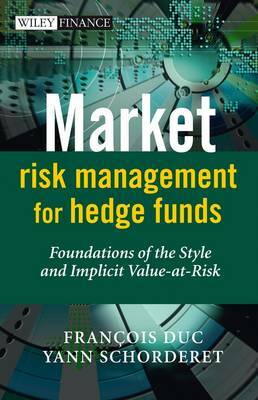 This book provides a cutting edge introduction to market risk management for Hedge Funds, Hedge Funds of Funds, and the numerous new indices and clones launching coming to market on a near daily basis. It will present the fundamentals of quantitative risk measures by analysing the range of Value-at-Risk (VaR) models used today, addressing the robustness of each model, and looking at new risk measures available to more effectively manage risk in a hedge fund portfolio. The book begins by analysing the current state of the hedge fund industry - at the ongoing institutionalisation of the market, and at its latest developments. It then moves on to examine the range of risks, risk controls, and risk management strategies currently employed by practitioners, and focuses on particular risks embedded in the more classic investment strategies such as Long/Short, Convertible Arbitrage, Fixed Income Arbitrage, Short selling and risk arbitrage. Addressed along side these are other risks common to hedge funds, including liquidity risk, leverage risk and counterparty risk. The book then moves on to examine more closely two models which provide the underpinning for market risk management in investment today - Style Value-at-Risk and Implicit Value-at-Risk. As well as full quantitative analysis and backtesting of each methodology, the authors go on to propose a new style model for style and implicit Var, complete with analysis, real life examples and backtesting. The authors then go on to discuss annualisation issues and risk return before moving on to propose a new model based on the authors own Best Choice Implicit VaR approach, incorporating quantitative analysis, market results and backtesting and also its potential for new hedge fund clone products. This book is the only guide to VaR for Hedge Funds and will prove to be an invaluable resource as we embark into an era of increasing volatility and uncertainty.